Fishing Lake Texoma this past week has been an adventure. High winds have made for rough water. 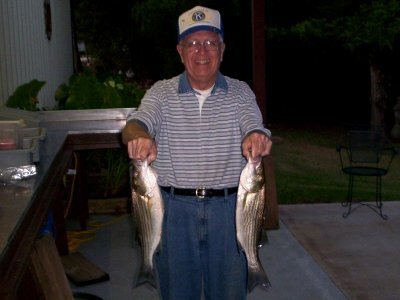 The stripers on Lake Texoma must be enjoying these conditions and have been giving us fisherman a high time all week. As I mentioned last week some seagulls and the egrets and blue herrings have been moving in and helpful finding the large schools of feeding fish. The past few days the seagulls have really moved in and taken over. Nothing is more exciting than seagulls screaming, bait fish boiling out and water and skipping across the surface trying to escape the big stripers blowing up under them. Some of the other guides on the lake have moved to live bait, but with all this action going on it is just too much fun to put up the topwater lures and slabs just yet. We've been catching our limits of good sized stripers and having a blast doing so. The fish are holding tight and running near the ledges. We are also finding good fish in 20-40 feet of water. Another good thing is that large schools of stripers are spread out. This makes for easier times of avoiding some of the boat traffic. The Lake Texoma stripers are getting better looking every day, good color and full bellies. Over the next 6-8 weeks we should see the bigger trophy stripers showing up. This time of year the weather can change on a moments notice. Be prepared for unexpected weather. Make sure you dress in layers for the cooler mornings and be sure to carry rain gear to keep you dry. Keep an eye on the sky for not only the birds but also for unexpected weather changes. If you are fishing in a cove, check out the tree tops as an indication of any wind changes. If it is too windy for you to feel comfortable on the lake, remember the old common sense rule, "If it don't feel right it probably isn't". Be safe and have fun fishing for Lake Texoma stripers.